XR-5 geomembrane meets the rigorous demands of harsh Texas oilfield environment. 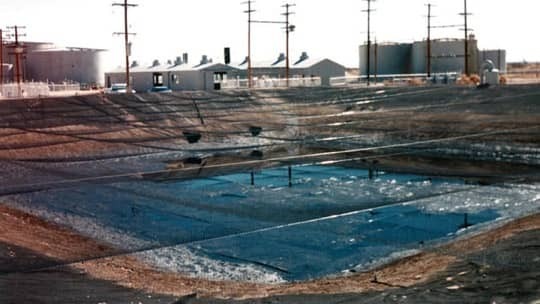 Recognizing the high performance features of XR-5 Geomembrane - high strength and puncture resistance, superior UV and chemical resistance - a large oil producer installed this oil/salt water holding basin in 1979. In this harsh environment, daytime summer temperatures can exceed 100 degrees and night temperatures often approach zero. This wide thermal spread requires that side slopes be covered for protection. But no cover is required with XR-5. Seventeen years later, this basin is still lined with the original heavily reinforced, composite 30 mil XR-5. It shows no signs of environmental stress cracking, no thermal expansion/contraction problems and no low yield strength like polyethylene, which claims to be superior because of its thickness. (In fact, a 100 mil HDPE installation of this type just four miles away failed in less than three years due to thermally induced stress cracking). The original field seams show no signs of deterioration and are still holding. Recognizing the high performance track record of XR-5 and its ability to meet the rigorous demands of this harsh environment, more and more producers are using XR-5 at their newer installations.